Inactive conformation of integrin. The membrane is shown schematically in gray. Our bodies are composed of approximately ten trillion cells, which poses challenging problems for structure and communication. All of these cells must be connected strongly together, to allow us to stand and walk. The infrastructure holding us together, however, must also be malleable enough to allow repairs, to allow us to heal from wounds. These many cells must also communicate with each other, ensuring that each plays its own proper part. Many different molecules in our bodies are involved in this complex infrastructure of support and communication, and integrins play a central role. Integrins are found on the surface of cells, where they form the link between the cytoskeleton inside cells and the extracellular matrix outside cells. There are dozens of types of integrins, each with a specific task. Most link to actin inside the cell, using adapter proteins like talin, but some link instead to intermediate filaments. On the outside of cells, different integrins have many different targets. Most cells have integrins that bind to components of the extracellular matrix, like collagen, fibronectin or laminin. Other integrins are used for special tasks, for instance, white blood cells have special integrins that allow them to attach to other cells as they search for infection and tiny platelets in the blood have integrins that bind to fibrinogen, allowing them to assist with the formation of blood clots. 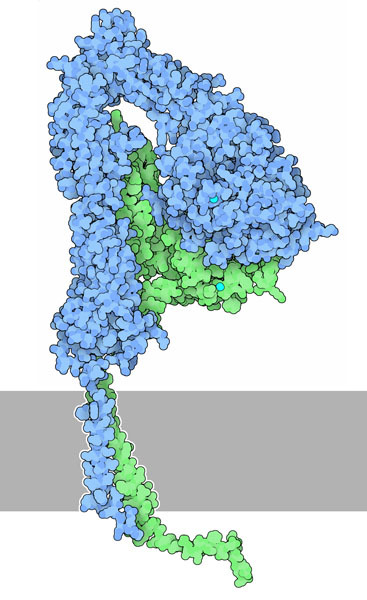 Integrins are composed of two chains (colored blue and green here), which fold into a flexible collection of functional domains. As with many flexible protein machines, the structures of integrins have been solved in parts. The illustration shown here includes three separate structures. At the top is a structure for the extracellular portion (PDB entry 1jv2 ), which extends outward from the cell surface. This is a connected through the membrane by a short transmembrane section (PDB entry 2k9j ). Two short cytoplasmic tails, shown here at the bottom, extend into the cell (PDB entry 1m8o ). 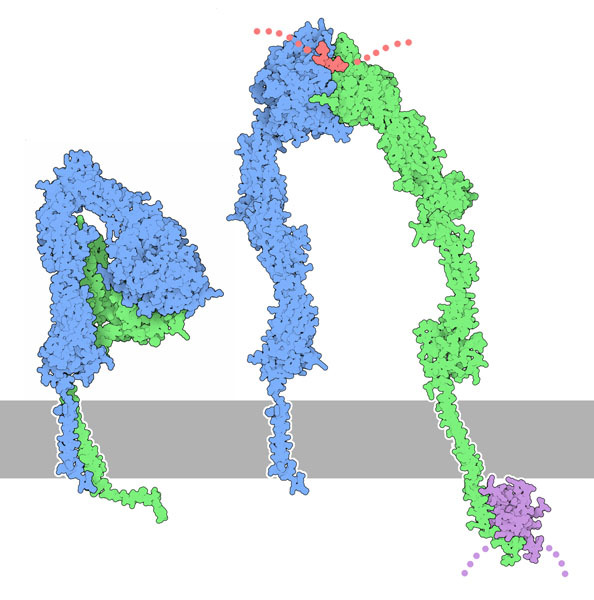 Inactive conformation of integrin (left) and a hypothetical model of the open, active form (right), with a fibrinogen peptide in red and a talin domain in magenta. When the structure of the extracellular portion was solved, researchers found that the large molecule folded like a switchblade knife, as shown on the left, placing the binding site close to the membrane. Studies by electron microscopy, however, suggest that this is an inactive "resting" form of the molecule, and when it is activated, it may open up and extend the binding site away from the cell surface, as shown on the right, ready to bind to its target. There is currently no structure for the open structure in the PDB, so this hypothetical illustration was created using pieces from several different PDB entries (2vdo , 3fcs , 2k9j , 2h7d ). A short peptide from fibrinogen is shown at the top in red, and one domain from talin is shown at the bottom in purple. Signaling through integrins goes both ways. The clustering of integrins when they all bind to a target sends signals into the cell, modifying how it controls its growth and shape. Some cells can also control the action of integrins from the inside: for instance, platelets need to activate their integrins before they are able to bind and form blood clots. Researchers have not been able to crystallize the entire extracellular portion in the open, active form, but they have studied a smaller fragment, which includes just the domains near the binding site. PDB entry 2vdo shows it in the open, active state, bound to a short peptide from fibrinogen. Click on the image to get an interactive Jmol image that allows you to compare the open and closed structures. Researchers have studied the interaction of integrins with different molecules inside and outside cells. Can you find structures that show these interactions? 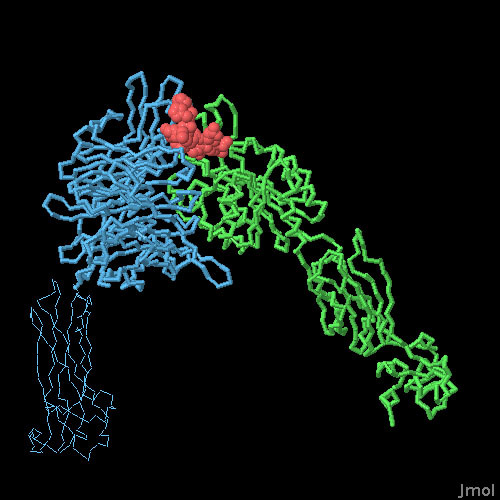 The structure of a snake toxin that attacks integrin is available in PDB entry 1v7p. Why would blocking integrins make a snake toxin more effective? S. J. Shattil, C. Kim and M. H. Ginsberg (2010) The final steps of integrin activation: the end game. Nature Reviews Cell and Molecular Biology 11, 288-300. M. A. Arnaout, S. L. Goodman and J.-P. Xiong (2007) Structure and mechanics of integrin-based cell adhesion. Current Opinion in Cell Biology 19, 495-507. B.-H. Luo, C. V. Carman and T. A. Springer (2007) Structural basis of integrin regulation and signaling. Annual Review of Immunology 25, 619-47. B.-H. Luo and T. A. Springer (2006) Integrin structures and conformational signaling. Current Opinion in Cell Biology 18, 579-586.